Discover your inner samurai with us! 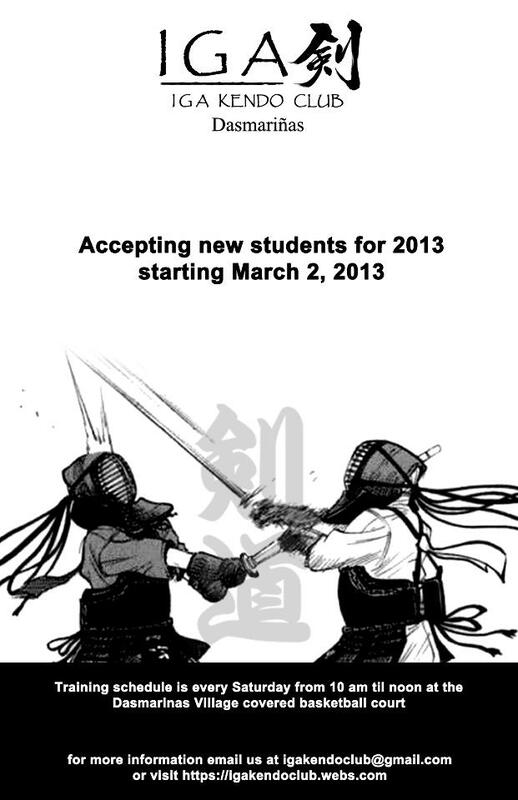 Dasmarinas IGA-Kendo Club will be accepting new beginners starting March 2, 2013. Interested applicants are strongly urged to pass by at least once, before March 2, in order to watch a session, and or participate in a free trial session. Please see the Introductory Course section for more details on how to join the club. Our Kendo Club conducts classes every Saturday from 10 am til noon at the Dasmarinas Village covered basketball court under the tutelage of Sensei Koji Igarashi. This entry was posted in Recruitment and tagged Dasmariñas, dasmarinas village, Dojo, Facebook, Iga Kendo, IGA Kendo Club, Johnny Besa, kendo, Kendo and Iaido, Koji Igarashi, Martial arts, sports. Bookmark the permalink.